Clinically proven digestive balance and comfort. Laboratory tested to survive stomach acid. B. lactis HN019 is shown to survive passage through the digestive tract to reach the large intestine and deliver maximum benefit to the gut. Optiflora DI is gluten free, soy free, and dairy free. No refrigeration required. Optiflora® DI delivers unique benefits via a proprietary formula with 10 billion CFUs with 4 bacterial strains, the most prominent being the powerhouse Bifidobacterium lactis HN019™. View the Optiflora® DI Product Sheet. 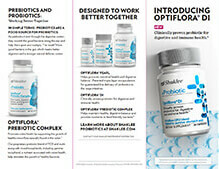 View the Optiflora® DI Brochure. View the Optiflora® DI FAQ. Optiflora DI's powerhouse strain B. lactis HN019 was tested to improve gut transit time2—the speed at which our food is digested. Leading probiotic researchers believe healthy gut transit time supports better gut metabolism. 1Gill HS, Rutherfurd KJ, Cross ML, Gopal PK. Enhancement of immunity in the elderly by dietary supplementation with the probiotic Bifidobacterium lactis HN019. Am J Clin Nutr. 2001 Dec;74(6):833-9. 2Waller PA, Gopal PK, Leyer GJ, Ouwehand AC, Reifer C, Stewart ME, Miller LE. Dose-response effect of Bifi dobacterium lactis HN019 on whole gut transit time and functional gastrointestinal symptoms in adults. Scand J Gastroenterol. 2011 Sep;46(9):1057-64.